Just 19km off the coast from Fremantle is Rottnest Island. It's a very popular holiday island for Western Australia and Perth's residents and other tourists that happen to be passing through (just like us). The island got its name from early Dutch explorers who named it Rotte-nest, meaning rat's nest, after the native marsupials, the quokkas, were mistaken for large rats. Despite the early naming mistake, it hasn't left people with a negative impression of the place, and each year this small island receives 500,000 visitors. We had been told a few times that we must go to Rotto (as the locals call it), and today was our day pencilled in for the trip. It didn't start all that promisingly though. We had stayed overnight in Fremantle (near to the ferry terminal) and woke early to check what the weather was doing. Clear blue skies above - this looked good! The TV report suggested otherwise, though, reporting showers by midday and even storms. This was a quandary because so often before now, the TV reports got it wrong, and given the size of Australia, a report for south-west Australia really isn't detailed enough. So, we used our eyes and took a gamble. Having got up early and stayed in a caravan park near to the ferry terminal, getting there on time shouldn't have been a problem, but I ended up cutting it fine, and making a wrong turn then parking in the wrong car park didn't help. Looking back at the map on the flyer for Oceanic Cruises, I realised that we were far too far away from the terminal, and headed back past the railway station, watching the minutes tick by. We both fully expected that we would miss the 8:30 boat, but with just minutes to spare I found the correct car park, hastily grabbed the things we wanted to take with us (masks, fins and snorkels - Rottnest is a fantastic spot for snorkelling) then ran across to the ticket booth. We had just 5 minutes before departure, so we asked about the weather in Rottnest (I figured that they would have a better idea than some wide-ranging TV weather report). "Oh, it'll be like this," said the lady, as I looked up to see the white hangers nearby in stark contrast against the beautiful blue sky. "Are you expecting it to be choppy on the way there?" asked Manda. "No, you should be fine," we were reassured again. Once on the boat, the skipper came through the upper deck and suggested that we should all head to the lower deck and sit at the back as it would "get a bit bumpy"; it wasn't a request, more of a command actually. 5 minutes out and we were getting very bumpy indeed, lurching violently back and forth, sometimes side to side, with waves crashing way over the boat. Sick bags were handed round to everyone on board and a few were, understandably, put to use during the (mercifully) short ride. 35 minutes can still seem like a long time, though, when you are being bounced around like this. We got to Rotto in one piece, but it was immediately obvious that the lady at the ticket counter had lied on both counts - the calm water (yeah, right) and the sunny weather (non-existent). In my rush to get on board the boat, I now realised that I had neglected to bring a top, a jacket or anything else that might offer me some warmth. So, there I was, walking down the cold jetty in just a pair shorts and T-shirt, lugging around a bag of snorkelling gear that we wouldn't be using and wondering what we could do for the rest of the day to keep ourselves amused. Our first stop at the information centre gave us more news about the weather - I overheard a conversion that included such phrases as "storm will hit within the hour", "rainy all day" and "gale warnings". With that, we headed for the nearby café and consoled ourselves with some hot chocolates. Realising that occasional hot chocolates would not be enough to keep me warm today, I did a little improvising - I grabbed my wet suit (a shortie), headed into the toilets and put it on underneath my shorts and T-shirt, like a thick set of thermals. It may seem like a bizarre idea, but immediately I felt warmer and I kept it on for the rest of the day. In winter time, there is a limited bus service called the Bayseeker. Once an hour, you can hop on the bus (not free, I might add - $7 gets you an all-day pass) and work your way around the island. However, getting off at any given stop would mean waiting for another hour to get back on again, and with the rain streaming down and limited shelter at each stop it's not the best way to experience the island. So, we got on a bus, went all the way around listening to the commentary and then headed back to the café for a hot choc top-up and a snack for lunch. While we ate and drank, we got to see our first quokkas. From a distance, I can see how these animals might have been mistaken for rats, but close-up they looked very much like small wallabies. While we ate, so did they - cleaning up whatever morsels they could find by our feet. The advice given to visitors is not to feed the wildlife (otherwise they won't remain wild for long) but when they just help themselves like this who's to blame? The staff there are used to their daily visitors, and would chase them off if they headed toward the kitchen area, but otherwise they left the little furry marsupials to mingle. 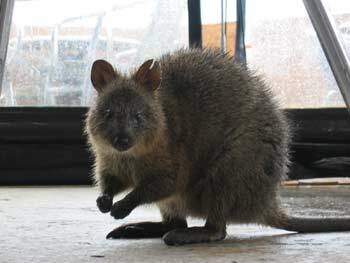 Anyway, with the weather being so rotten, these might be the only quokkas we'd get to see! 'Yes, you've been caught red handed!'. A quokka scavenging for food at the D�me Caf�. After lunch, we repeated the bus tour all over again. When we got back to the main bus station, we stepped off the bus into the rain and cold then changed our minds, turned around and got straight back on and went round again. After our third circuit, can you guess what we did next? We went to the café again for more hot chocolates! That pretty much summed up the day: hot chocolates in the café and bus tours around the island. Leaving the island later that afternoon was a different experience from the trip over. No harsh bouncing around - this time around we 'surfed' our way back to Fremantle with the waves behind us. So we managed to get some water sports in after all! While our visit may have been an almost total wash-out, we could still appreciate that Rottnest is a beautiful spot. The water along the various bays and beaches we saw was still tantalisingly clear for snorkelling, keeping a beautiful turquoise colour despite the grey skies. If we get time, we might well come back to Rotto and see it in a better light. Here's hoping.